This page is a translated version of the page Osmia and the translation is 100% complete. Osmia was founded in 1919 by Hermann Böhler and has been for long one of the leading German fountain pens manufacturers, and it was for a short period a Parker subsidiary for european production. Since 1935 the Osmia essentially became a division of Faber-Castell, who started an acquisiton, completed in 1951. But because the prestige of the brand, acquired by Osmia thanks to the absolute quality of his pens, the trademark was maintained for a long time after the complete acquisition by Faber-Castell. It disappeared only in the early '60s, when the crisis derived from the success of the ballpoint pen pushed Faber-Castell to produce cheaper models. Osmia was founded in 1919 by Hermann Böhler under the name of Böhler und Cie, in Dossenheim, near Heidelberg. Böhler, as many others of his colleagues who made a similar choice, left Kaweco to create a new company with his brother Georg, leveraging the expertise gained in this field inside Kaweco, during the years in which that company acquired A. Morton & Co. to realize a production of gold nibs. The initial Osmia production consisted primarily of mechanical pencils and hard rubber safety pens. The Osmia logo was a diamond placed inside a circle. The first version of the logo consisted in a convex Greek cross, but has been reported that given the similarity with its own logo Osmia was brought to court by Montblanc, that required a very high compensation and the complete destruction of the entire production. That would have destroyed the company, but the case was resolved with an agreement and Böhler had to change the symbol transforming the cross in a diamond. The company name, Osmia, derived from a special metal alloy, called Osmiumalloy for which the Böhler brothers obtained the use thanks to a patent of the Heraeus company in Hanau, The Osmiumalloy was used widely for the tips of the Osmia nibs, and the alloy, though much more expensive, had a much higher quality respect to natural iridium then available in Germany (which contained many impurities that it favoured wear), and allowed the company to provide a lifetime warranty on their pens. Osmia had a great initial success, becoming in a short time the second largest producer of pens in the country, so that a plant was specially created to produce pens. In the late '20s however sales had slowed and margins were weak, so the company went into financial troubles. In this period Parker, who was trying to expand its business into Europe, began to take an interest in Osmia which was acquired (or with whom took an interest, sources are unclear) in 1928. In this period the company produced the Duofold for the European market, characterized by the imprint "Parker - Osmia A. G. Heidelberg". During the same period the company continued to produce under the Osmia brand, with mottled hard rubber safety pens, lever filler pens and mechanical pencils, which retained the original logo on the cap. Around 1930, Parker withdrew because the Duofold sales did not have a great success because of a price too high for the German market, and a too rigid nib. The activity went on (or was given, sources are unclear) to Osmia Gmbh, again under the direction of the Böhler brothers. It was launched a new line, the Osmia Supra, similar to the Duofold, with an improved button filler, and a brass enameled logo on top of the cap. In 1932, facing financial difficulties for the return of investment to the Parker, the nib factory was sold to Degussa. In 1933 the pen style was amended to follow the streamlined trend also used by Duofold of the same time. Were also launched other models: the Luxus line, a torpedo-shaped piston filler, and the the Osmia Progress, with a filling system similar to the Vacumatic one. Despite the financial troubles due to end of the cooperation with Parker, Osmia got a good selling success. Since 1935 the company was gradually acquired by Faber-Castell, even if the final sale of all ownership was made only in 1951. 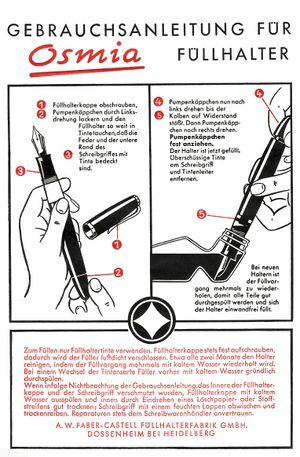 The fountain pens took the inscription A. W. Faber-Castell Dossenheim but nevertheless the continued to bear the Osmia brand and logo, which was well known and respected, until the '60s. In 1938 Hermann Böhler resigned from Osmia to found in Dossenheim another company with its name that produced pens and automatic pencils. Most of the production of Faber-Castell fountain pens was however done with Osmia trademark. In 1935 were introduced several models with different filling systems. Using the piston filler were: the Supra Luxus in chiseled black celluloid, produced in the 42, 44 and 46 measures, the Supra in the black or blue or silver or gold colors, with a black cross-striped transparent section produced in the 72, 74, 76, and 78 measures, the Brilliant similar to the Supra but only in black celluloid and in 62, 64, 66 measures, and the Brilliant, black, in 54, 55 and 56 measures. Using a membrane filling system were the Supra Progress in plain colors (black, green, red, gray, blue, silver and gold) and 192, 193, 194 and 196 measures, and the Osmia Progress in the 92, 93, 94 and 96 measures. Finally using the button filler the Osmia Brilliant produced in black, gold, red and green and 232, 126, 127 and 128 measures. In the late '30s, because of World War II, like all other German manufacturers the company suffered major difficulties, but despite the production was reduced for the call to arms of most of the employees, it remained active. After the war, not having the facilities suffered significant damage, production was resumed at full speed from 1946, proposing the same models of before, but with only with a piston filler and with the explicit endorsement (in addition to the Osmia brand and logo) of A. W. Faber-Castell. In the '50s Osmia introduced a series of new models like the Supra 880, in three sizes (2, 3 and 4) in black, with a band on the cap and an ink level indicator, the Supra 666 in four sizes (1, 2, 3 and 4), in black, gray and pearl and red and pearl colors, with rings ont the cap and gold and steel nibs, the Osmia 74D in black plastic, designed to make carbon copies, and the Osmia 52 for the student market. Starting from 1955 were introduced two more streamlined models: the most prestigious, which were intended to compete with the Montblanc 146 and 149, were 446 and 448, with three ring and the logo engraved on the cap, bicolored gold nib and a straight clip. To these followed the mid-range models 882, 883 and 884, in black or green stripes, a band on the cap and a beak clip. In the early '60s the Osmia trademark was no longer used; a number of hooded nib plastic models were introduced, they were thinner than previous one and marked A. W. Faber-Castell, with a transparent section for ink level view. The luxury line was called 66, with body in black, red, blue or green plastic, rolled gold cap and gold nib, the mid range models were called Faber-Castell Progress and produced in three versions: the 77S in plastic with a steel nib, the 55S with silver cap, plastic body and steel nib, the 55G with gold nib. It was also produced a student model called 54VT, because the Vest Tank, with a secondary reservoir usable through a valve. In the late '60s, as for most of the other fountain pens producers, having also completely erased a prestigious brand that enjoyed a wide popularity, sales had an irreversible decline, holding only partially for the students pens. In 1975, during a corporation restructuration, Faber-Castell completely eliminated the entire field of fountain pens production, resuming today, with the return of interest for this popular writing tool. In the early '60s Faber-Castell ceased to use the Osmia trademark, starting to a production of cheap models for the scholastic market marked only by its brand name, with a drastic reduction in sales, accentuated even more by having removed from the market a prestigious brand. ↑ In a FPN post with an interview to Gregor Miltner, an Osmia from its birth, also become chairman in its later years. ↑ A FPN message with more details about the topic of Osmia nibs. This page was last edited on 28 June 2017, at 20:01.